On Sep 30, 2018, the "Mein Schiff 4" assisted nine distressed North African migrants 30 miles east of the Spanish coast. while enroute from Malaga to Palma de Mallorca. Their boat was adrift 30 miles East of Cape de Gata with engine damage. The crew alerted the Spanish Coastguard, and the "Salvamar Algenib" of Salvamento Marítimo headed to the position and took the migrants aboard. They were transported to Alméria, and the "Mein Schiff 4" continued the voyage to Palma de Mallorca. 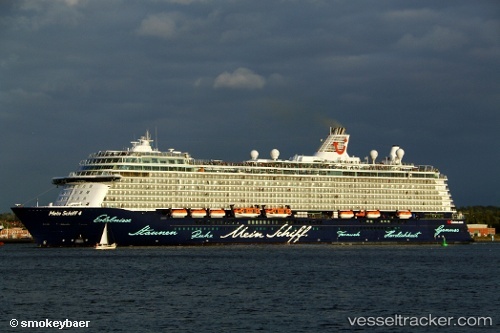 The "Mein Schiff 4" cancelled its call at Honningsvåg in the morning of June 6, 2018, as the wind was too strong. The Nordkap trip was part of an 11-day cruise that started and ends in Kiel. During the trip, the ship had scheduled calls at Vestlandet, Tromsø, Honningsvåg and Trondheim. But strong wind made it too difficult for the vessel to hold the position for tendering, which led to the decision to sail on to Trondheim. Also the "Spitsbergen" changed the route for the second time this year. The ship would actually call at Hornvika, but sailed to Kai west of Honningsvåg due to the strong wind. Meyer Turku handed over Mein Schiff 4 to TUI Cruises. The day was remarkable since this was the first delivery from Turku Shipyard under Meyers' ownership. Two days earlier, on 6 May 2015, the Meyer family, operating the shipbuilding company Meyer Werft in Germany, became 100% owner of the Meyer Turku Oy, the shipyard's owner said in a press release. Meyer Turku has showed its capabilities in building the most demanding and complex cruise ships. Now, with Mein Schiff 4, Meyer Turku has refined its building processes even further. The project entered production two years ago and in February 2014, the keel of the ship was laid in the dry dock, and, in October 2014, the ship got water under her keel for the very first time. The production of the next evolution in the Mein Schiff series, Mein Schiff 5, started in February 2015. In June, there will be a keel laying ceremony for Mein Schiff 5 and, on the same day, the production of Mein Schiff 6 will start. By the end of this year, Mein Schiff 5 will be floated out and she will be delivered to TUI Cruises in the summer of 2016. Mein Schiff 4 is 294 metres long and 36 metres wide. The ship, with a gross tonnage of 99,500, has a total of 1,253 cabins. 90 percent of these are outside cabins, 82 percent also have their own balcony. With a wide range of different cabin categories on offer, including cabins for families and spa fans, Mein Schiff 4 caters ideally to passengers’ individual comfort and well-being. Special highlights are the sea-and-sky suites over two decks, which feature their own 29-square-metre roof terrace.